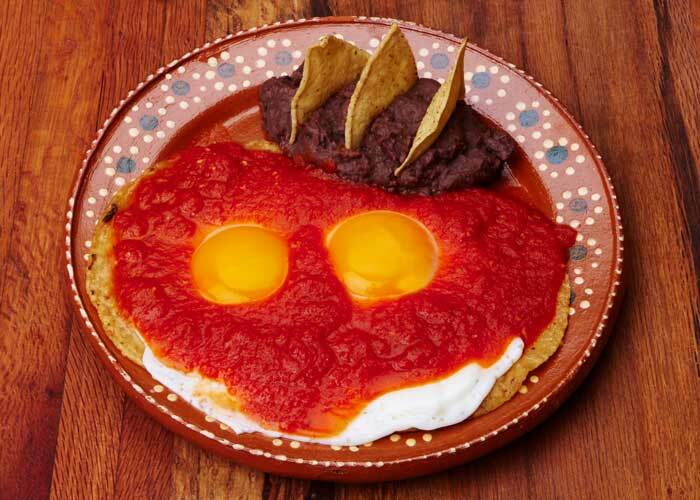 When you need a hearty breakfast, you can’t beat authentic huevos rancheros, a dish prepared with two sunnyside-up eggs on fried tortillas covered in a spicy tomato salsa with refried beans on the side. This dish is served throughout Mexico, and for good reason. It’s delicious! 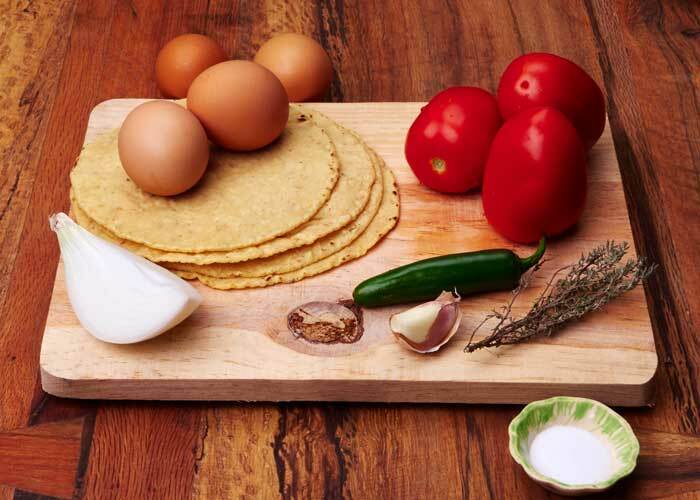 The name huevos rancheros translates as “ranchers eggs.” When preparing, keep it simple and traditional. You don’t need to fancy-it-up with toppings like sour cream, chopped tomatoes, green onions or avocado. You can if you want, but I might get a little bent out of shape. Each bite should be a balance of rich salsa, egg and corn tortilla. The other stuff just gets in the way. 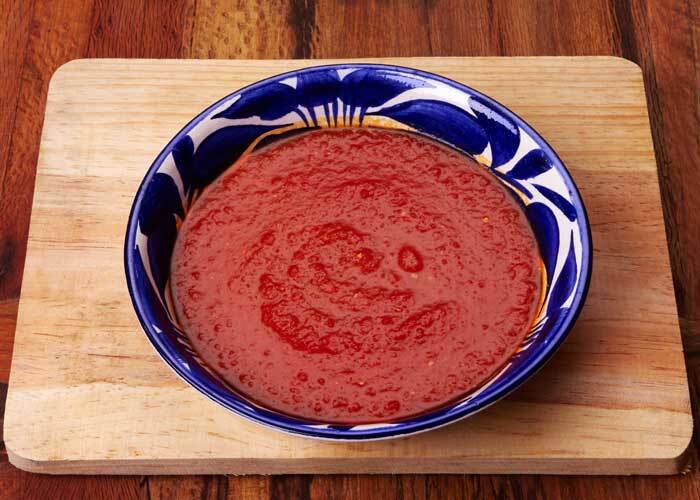 In Mexico, the salsa is made very hot. This recipe calls for 1 serrano chile which makes a milder salsa. Add 1 or 2 more chiles if you want it hot. You probably already have all the ingredients necessary in your pantry. The first thing you need to do is prepare the salsa for the huevos rancheros. The salsa makes the dish. Bland salsa means bland eggs. To make your salsa, roughly chop the vegetables and add them to the blender jar. You don’t need to seed the tomatoes or serrano chile. 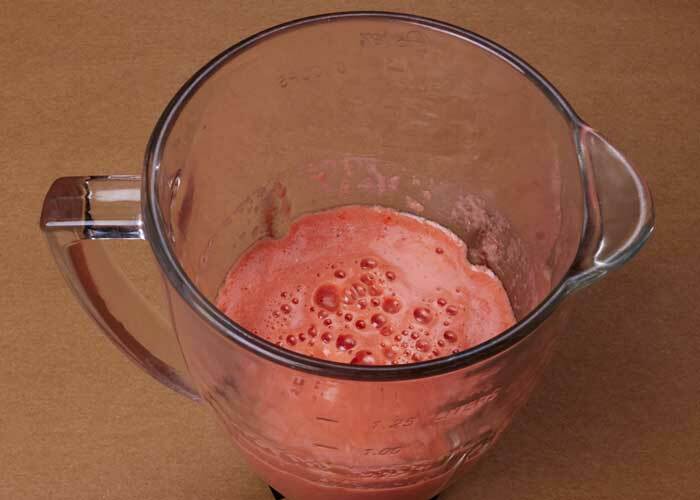 Add a couple of tablespoons of water and blend until smooth. At this point, it will have an unappealing pink color. But don’t worry, as it cooks it takes on a beautiful dark red color that looks spectacular on the plate. Frying the salsa is an important step to developing the flavor of the salsa. Heat 1 tablespoon of cooking oil in a saucepan. Slowly pour the contents of your blender into the pan. Be careful. The mixture tends to spatter when it hits the hot oil. Simmer the salsa for about 10 minutes. When the salsa has developed a deep red color it is ready. 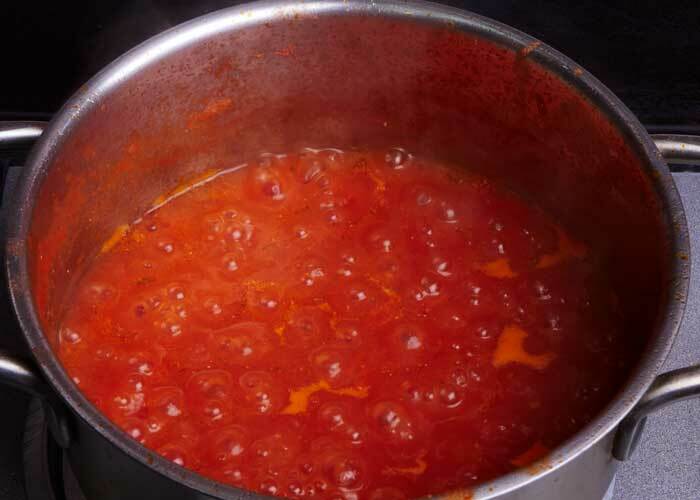 If the salsa is too thin, simmer for a few minutes to thicken. Salsa too thick? Add water 1 tablespoon at a time until the desired consistency is reached. Salsa too thin? 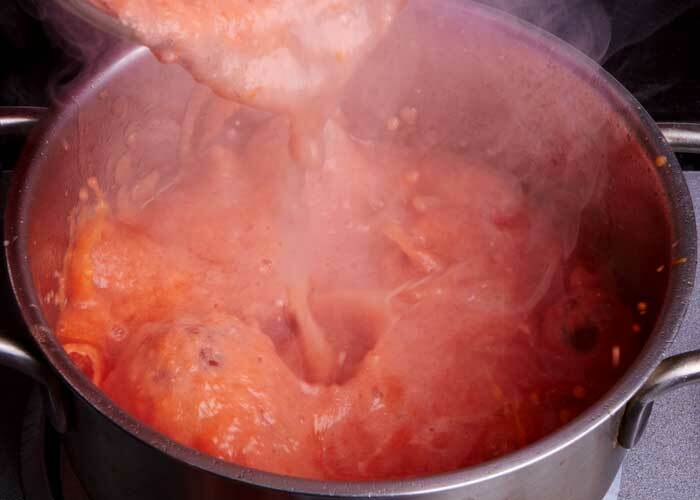 Simmer for a few more minutes until you get the desired consistency. A little bland? Make sure you have added enough salt. Not hot enough? Blend 1 serrano chile with 3 tablespoons water for 1 minute. Add to salsa and cook 5 more minutes. 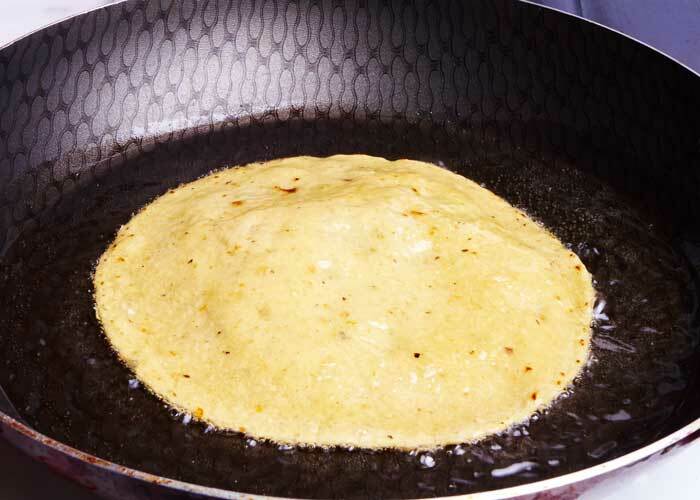 Fry the tortillas in 1/4 inch of medium hot cooking oil. Fry them lightly for about 20 seconds per side until the tortilla is just becoming crispy on the edge but the tortilla remains pliable. Don’t allow the tortilla to become crispy. Why fry the tortillas? The process of frying adds flavor to the tortilla and keeps it from getting mushy from absorbing the salsa and runny egg yolk. You might be tempted to skip this step but you shouldn’t the dish isn’t the same without frying the tortillas. Set aside the tortillas and cover them with a napkin to keep them warm while you prepare the eggs. A note on tortillas – Better quality tortillas make for better huevos rancheros. This is a simple dish with very few ingredients. Quality matters. You should be able to taste the rich corn flavor of the tortilla. Avoid the corn tortillas that come in the plastic bags and are stocked on the grocery store shelves. They taste like cardboard and have preservatives in them. If you can’t buy any freshly made tortillas try making your own. 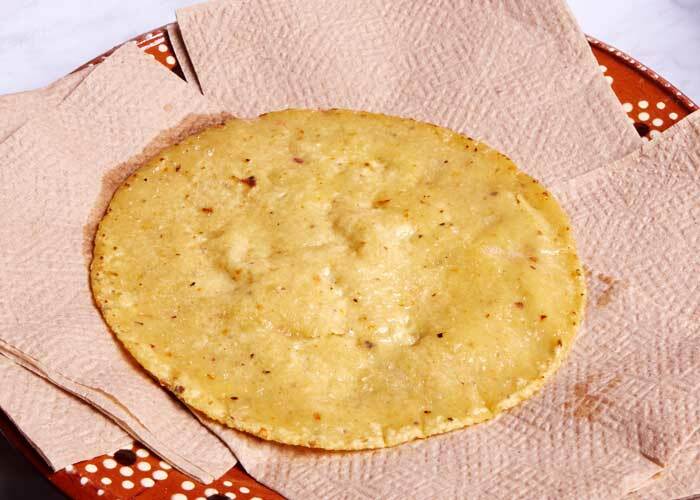 Most grocery stores carry corn flour for preparing tortillas. Tortillas are simple to make. Just follow the instructions that are on the side of the package. If you don’t have a tortilla press you can use a rolling pin. 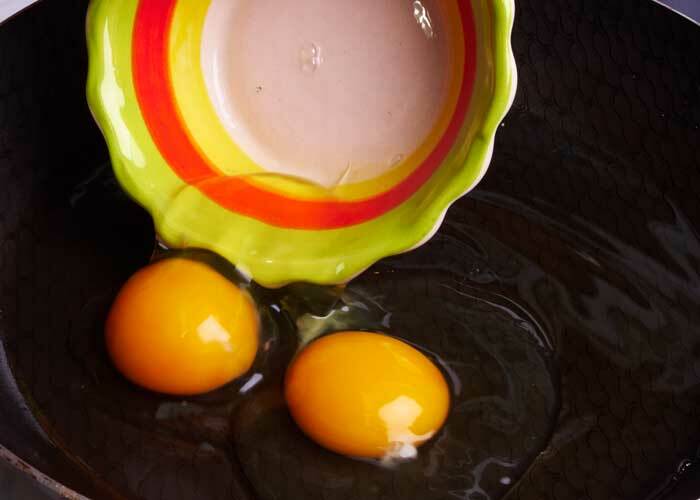 By cracking the eggs into a bowl before putting them into the frying pan you are less likely to break the yolk. You use the bowl to gently slide the eggs into the pan. 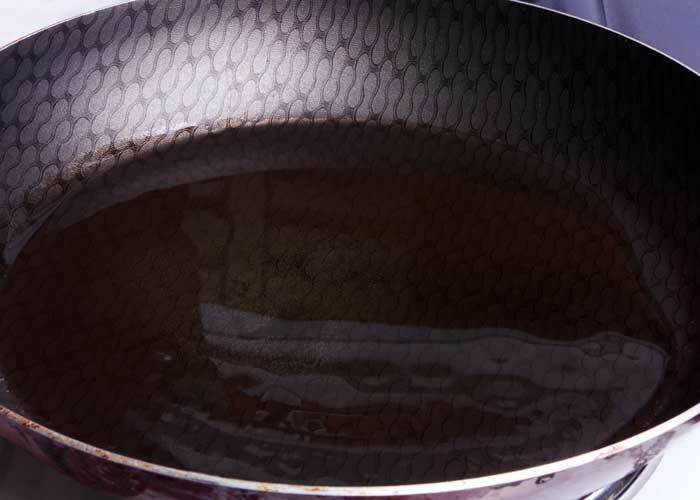 Heat the oil in a medium-sized frying pan. Non-stick is best. You will use the same oil to fry the tortillas and the eggs. Cook the eggs until the whites are just set. The yolk is supposed to remain runny. When you cut into the eggs on the plate, the yolk mixes with the salsa and creates an incredibly rich sauce. 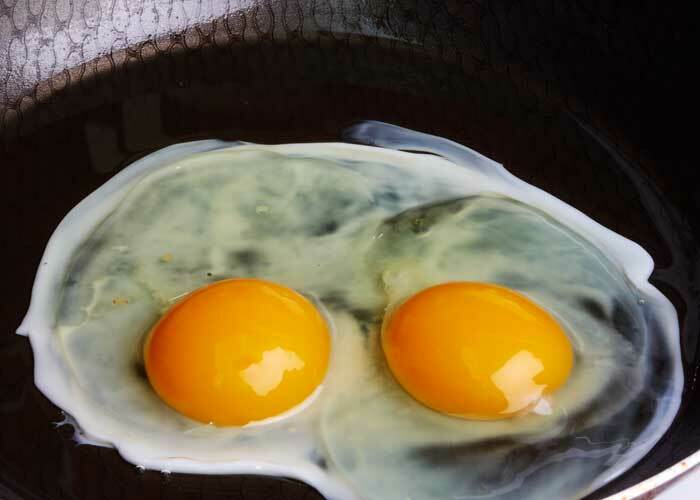 Note – If you are worried about eating eggs that aren’t cooked all the way through, you can cook the yolks until they are solid. The dish will still taste great. You lose a little of the visual element but you have peace of mind. When your eggs are ready it is time to plate the dish. 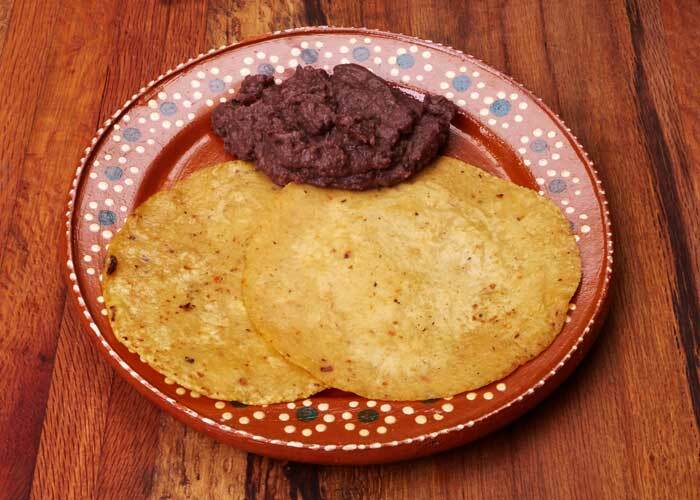 Place 2 tortillas on your serving plate and with large spoonful of refried beans on the side. Carefully slide the eggs onto the tortillas. You don’t want the yolks to break. Gently spoon the warm sauce over the eggs being careful not to cover the yolks. 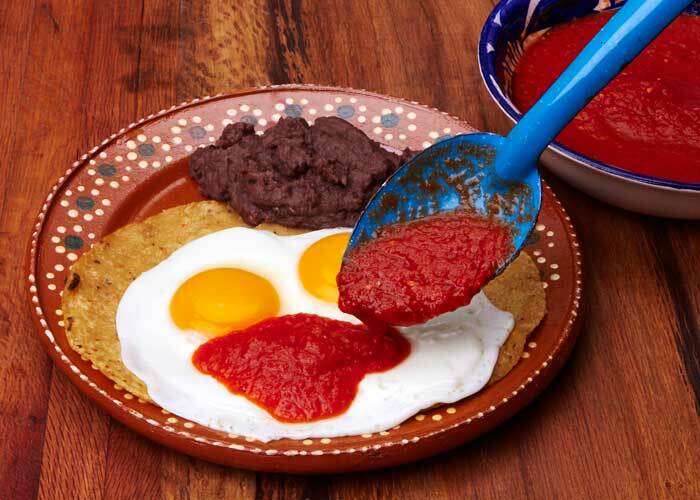 The deep red salsa contrasts with the bright yellow egg yolks. You want the salsa to a little bit thick so it doesn’t run all over the plate. Garnish the refried beans with three tortilla chips. You can sprinkle a bit of crumbled cheese on the beans if you like. Cotija cheese goes well. Serve immediately. If you let this dish sit the tortillas get soggy. Time to start cooking! Provecho! 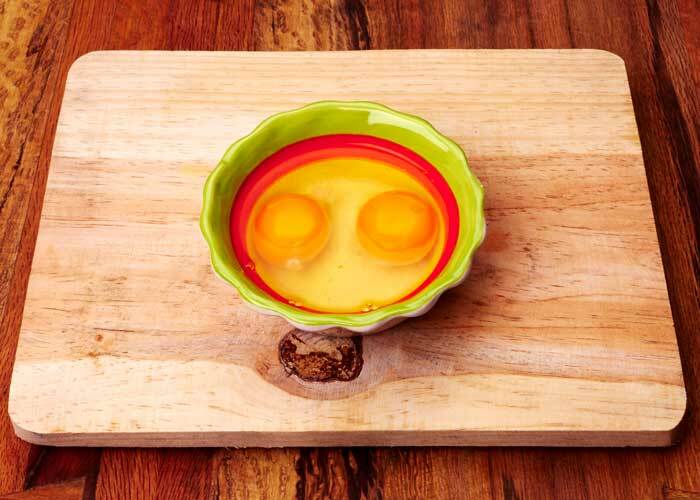 If you prepare this dish with salsa verde on one half of the plate and salsa roja on the other half it is called “huevos divorciados,” or “divorced eggs” because the two salsas are “divorced.” This is a very colorful and delicious way to serve your eggs. Let us know if you have any questions about how to prepare this recipe. You can contact us here. You can also leave a comment below. 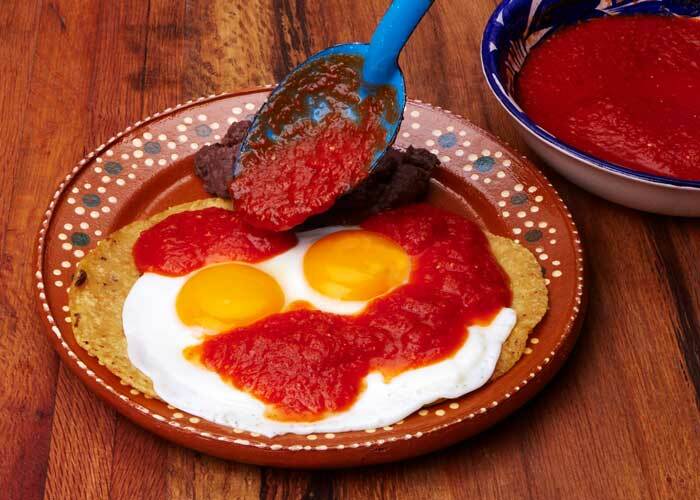 Recipe for easy authentic "huevos rancheros" a Mexican breakfast dish prepared with two sunnyside-up eggs on fried tortillas covered in a spicy tomato salsa with refried beans on the side. A healthy and filling way to start your day. Roughly chop the tomatoes, onion, garlic and serrano chile. Add to your blender jar. Add 1/2 teaspoon thyme to the blender jar. Add 2 tablespoons of water. Blend until smooth. About 1 minute. Heat 1 tablespoon of cooking oil in a saucepan to hot. Simmer for about 10 minutes until the salsa is deep red in color and has thickened slightly. Pour 1/2 cup of cooking oil into a medium sized frying pan. The oil should be about 1/4 inch deep. Heat the oil to medium hot. 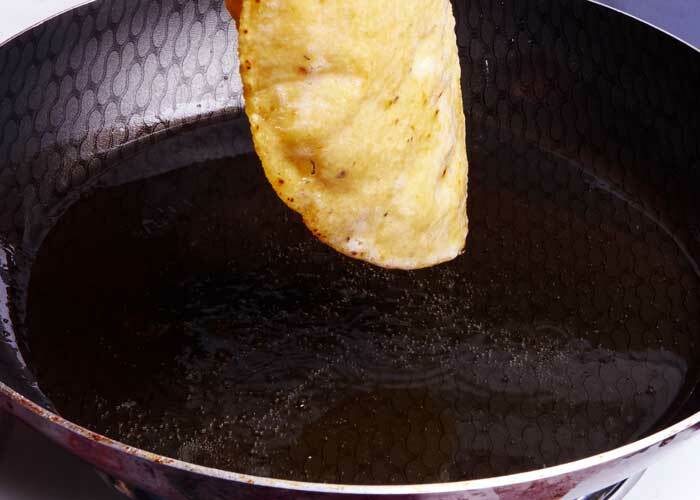 Place the tortillas in the oil and fry for about 20 seconds on both sides. Fry them one at a time. Don't allow the tortilla to harden. Drain the tortillas of excess oil and set aside. Use the same cooking oil that you used to fry the tortillas to cook the eggs. Maintain the oil medium hot. Add two eggs to the hot oil and slightly tilt the pan to one side so that the eggs set closely together. Cook until the white are just cooked through and the yolks are still runny. Place 2 tortillas on your serving plate and add a good sized spoonful of refried beans. Gently place the eggs on the tortillas. Spoon the warm spicy tomato salsa over the eggs. Garnish the beans with 3 tortilla chips. You do not need to remove the seeds and veins from the chile. You do not need to seed or peel the tomatoes. If the salsa is a little runny, simmer until it reaches the desired consistency. Add a pinch of crumbled cotija cheese or ranchero cheese. White onion is preferable but you can use yellow onion if that's what you have on hand. You can substitute Mexican oregano for the thyme. High-quality eggs make the dish even better. Try making it with organic free-range eggs. I made these for my fiancé and they are flavorful, he was happy and content! Glad you enjoyed the huevos rancheros recipe! Have you tried any of our other recipes? I’m not big on a sunny side up egg, could I possible to a scrambled egg for this recipe? The huevos rancheros recipe will still taste great with scrambled eggs. Give it a try. Cheers! Good to know! I plan on making it tomorrow morning! So yummy! Made last week for my husband and he loved the salsa! Love the simplicity of recipe and raw flavors. Will make again. Excellent, glad you and your husband enjoyed the recipe! Thank you for the delicious and easy recipe! I believe the origin of huevos rancheros is Moroccan or north African. Moroccan charmoula sauce is identical tomexican salsa. the only difference is that in Morocco cilantro is used as the herb. Then the eggs are cooked in the charmouls, either scrambled or whole. 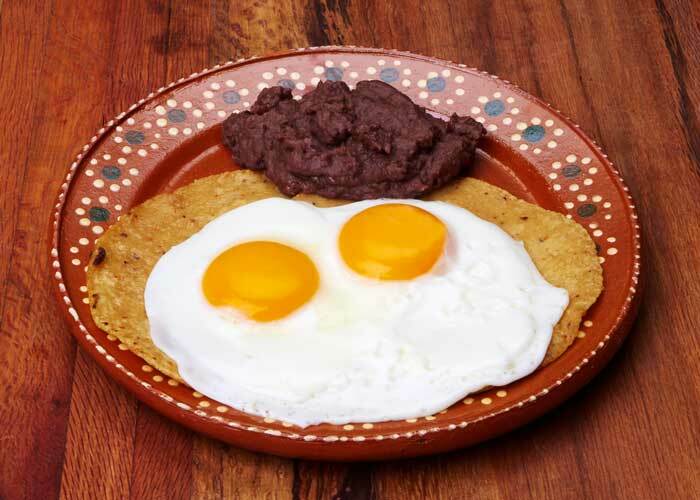 I don’t know from beans—pun intended—but I would be careful taking huevos rancheros away from Mexico. Might not both countries or regions have developed very similar dishes independently? This is easy & delicious! Now Huevos Rancheros is my new go-to breakfast! Yum. Luckily here in Charlotte we have easy access to fresh tortillas I get El Milagro at the store Que Rico! can this salsa be saved for later? I know some salsas break down quickly. You can refrigerate or freeze the salsa for later. It shouldn’t break down. If it does, you can whisk it or give it a quick shot in the blender to reincorporate the ingredients. Cheers! I made this for breakfast yesterday and because it was so good, I had it again for breakfast this morning. Then, because I made double the recipe, my husband went out and bought tortilla chips just so he could eat the rest of the salsa up. Amazing recipe, thank you! Use 1/2 tsp. of thyme. Cheers! I made this today. My salsa didn’t take on that beautiful red colour in the photos. I did try cooking it for much longer to try to get the red colour and though it improved a bit, it wasn’t a rich red at all. The consistency wasn’t totally smooth like the photos either. I used medium/large vine tomatoes with a couple of cherry tomatoes too as I really wanted that vibrant red colour. Also, while the ingredients say “salt to taste”, the actual recipe method doesn’t mention salt, except where it says what to do if the sauce is too bland. Nope. Nope. And nope. Definitely not traditional or authentic.